A short walk from Outram Park MRT lies the humble enclave of Everton Park. The small estate is populated mostly by the elderly, but many new cafes and eateries are beginning to find footing there. 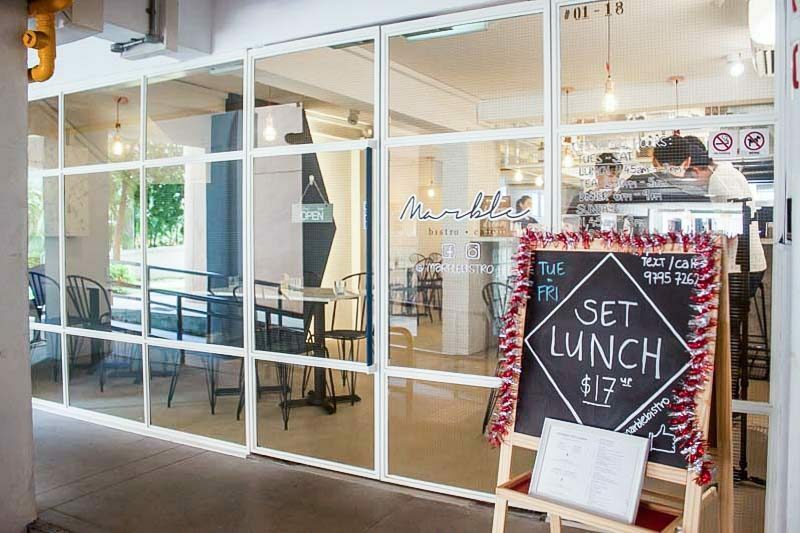 One of the newest places to join the pack is Marble Bistro – a 28-seater casual eatery that serves up affordable modern small plates that certainly deliver in the flavour department. The owners and staff are graduates from the Culinary Institute of America (CIA) which partners with the Singapore Institute of Technology. This explains the modern cooking techniques and creativity of the dishes. 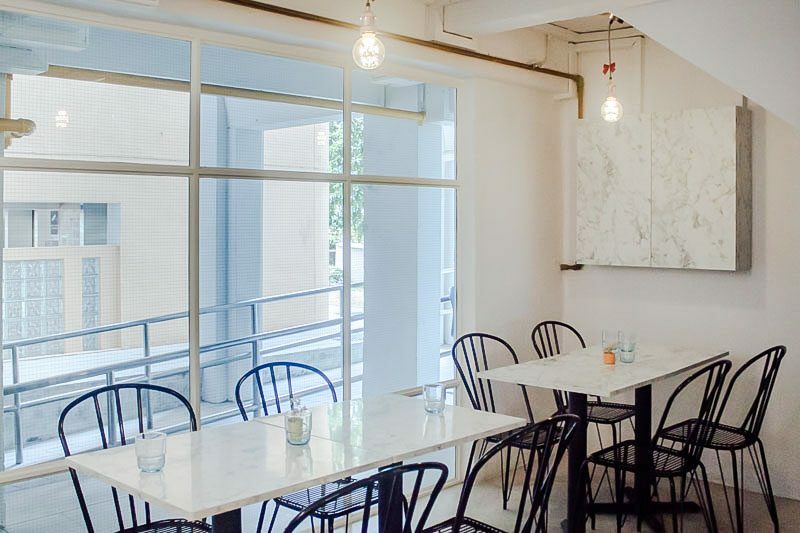 The small eatery boasts a minimalist interior with the use of different textured white-washed walls. 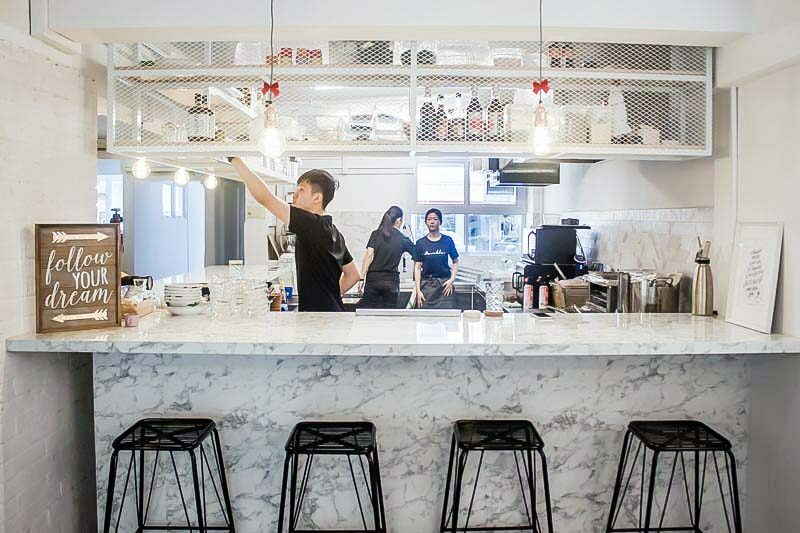 Aptly called Marble Bistro, marble surfaces feature heavily as the central theme. Psst, come dressed in monochrome if you want to take some amazing photos here! We’re always suckers for drink combinations that sound too good to resist. Choose from Slow-Pressed Juice Infusions ($5.50) including Red (watermelon, lychee, mint, lavender) or Yellow (pineapple, orange, grape, chamomile) for a healthy boost to accompany your meal. It was a hot day and we yearned for something refreshing so we opted for the Elderflower Spritzer ($4) and Pink Lemonade ($4) instead, which were pretty to look at as well. 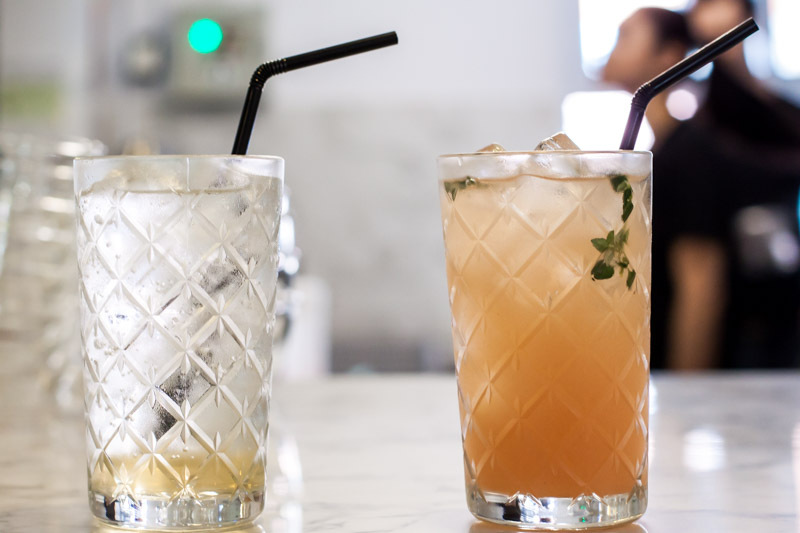 The Spritzer had a mellow floral fragrance that paired well with the fizziness in the drink, while the Pink Lemonade was fruity, sour and well-balanced in terms of sweetness. The small menu at Marble Bistro features very interesting dishes and the prices are justified by the level of skill that goes into each individual component. A weekday lunch set will set you back by $17 nett, with a choice of a drink/soup, a main course and a dessert. For a gastronomic experience to remember, we recommend going for the seven course dinner set ($37 nett) which will allow you to try most of the creations. Our degustation began with Honey Stars & Milk ($6.50). 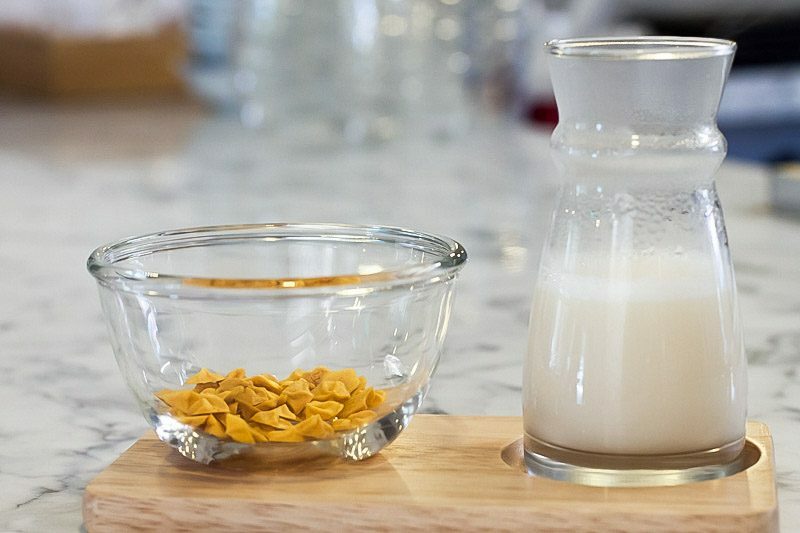 At first sight, we wondered why we were being served breakfast cereal as a starter. Turns out, it’s actually pumpkin meringue stars paired with a milky chicken broth. Credit goes to the Chef for creating a dish based on a bit of nostalgia that we can all identify with. Try a pumpkin meringue star on its own before pouring the milky broth over; that way you can savour the differences in taste and texture. We thought the chicken broth could use a more intense flavour, but this was otherwise a sweet and savoury start to our meal. This may look like a cup of joe but the Mushroom Macchiato ($6.50) is far from anything coffee related. The dark layer at the bottom is a mushroom consomme that has been boiled over 15 hours using shitake, portobello and white button mushrooms. 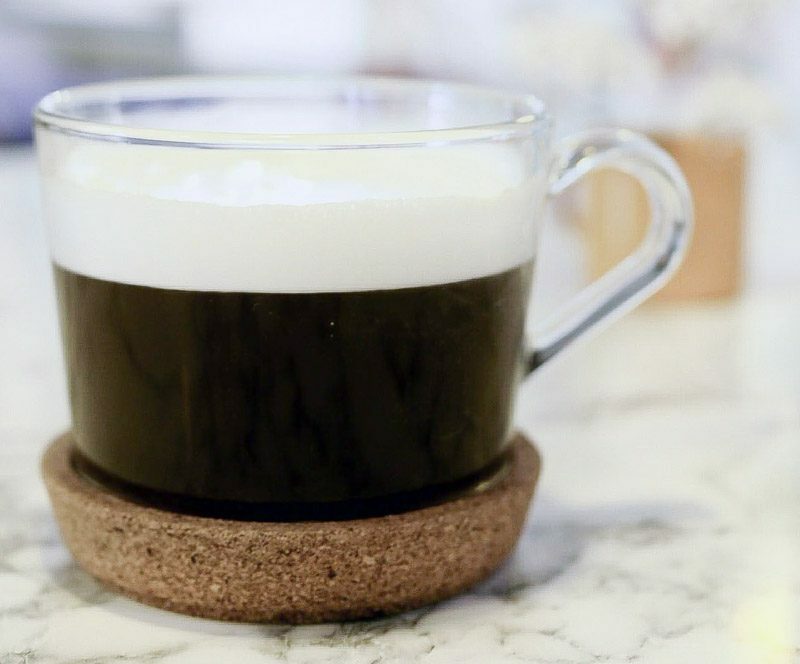 The top white layer is actually truffle foam, which complements the flavours beautifully. We loved the intense earthy and umami flavours in this soup, and slurped it down like a cup of good coffee. 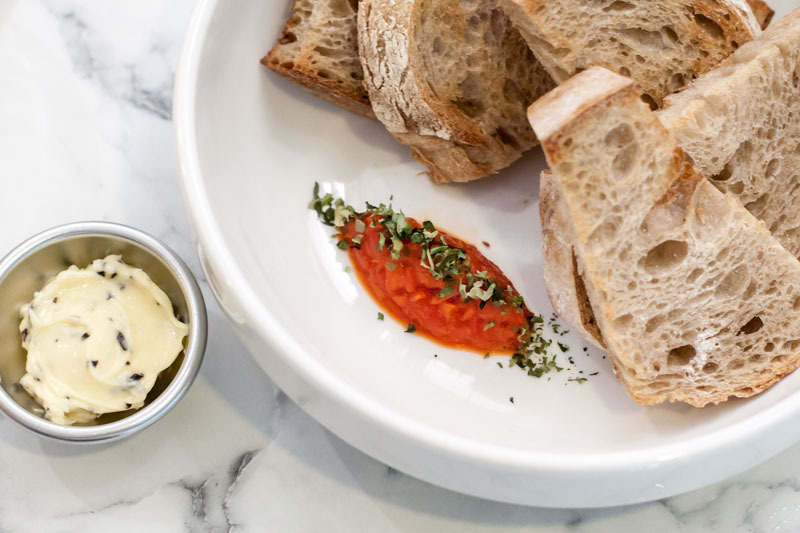 A rather humble looking dish, the Rustic Bread ($7) comes served with two spreads that make a world of a difference to the sourdough bread. The first is a smoked kombu butter that adds a layer of creamy saltiness and smokiness to the bread. For a sweeter and more savoury option, try the red capsicum chutney that is topped with dried seaweed. This dish may be called Deviled Eggs ($8), but its plating is beyond angelic. 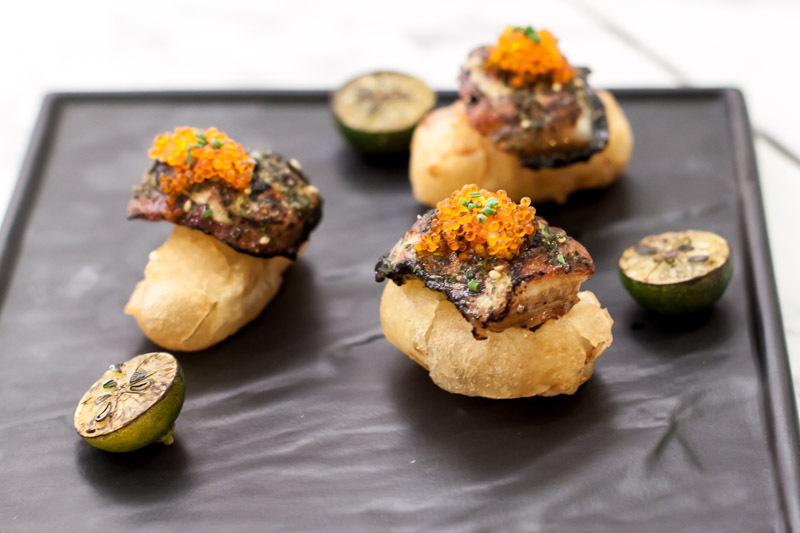 Eggs are done two ways in this dish; The first is a spiced yolk mousse that’s piped into mini pesto cones and topped with chives and bonito flakes. It’s so tiny that you can just pop the entire thing into your mouth. The creamy and smooth mousse is packed full of flavour and enhanced by the subtle herb fragrance released by the pesto cone. The second style of eggs is housed in a bell jar lid that contains hickory smoke. Lifting the lid releases an earthy aroma that has infused into the shoyu marinated quail eggs that still contain a runny yolk. For an egg that tiny, getting it to that texture certainly takes some level of skill. The Fish & Chip ($8) at Marble Bistro doesn’t look anything like its traditional variation, and is strongly influenced by Japanese cuisine. 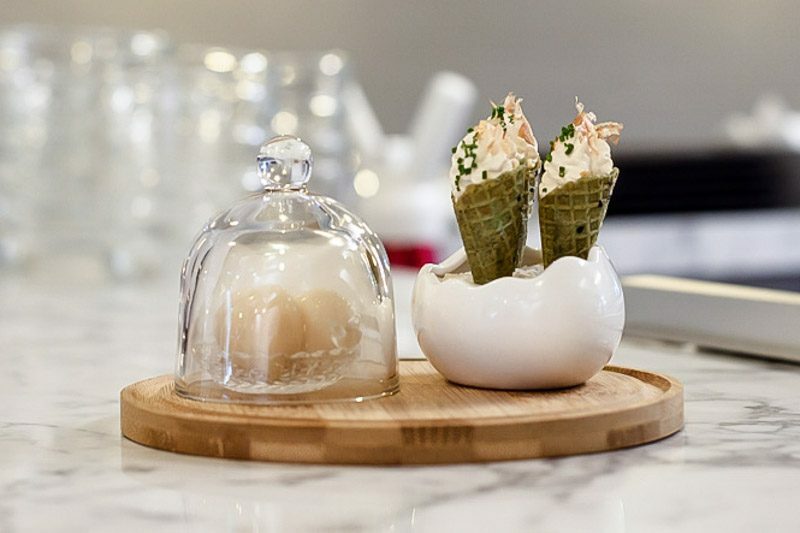 Each bite features a triple-cooked potato which is first boiled in a chicken rosemary stock, then coated with corn starch for a quick fry and finally coated again with a Chinese dim sum-like batter to form that crispy external layer. A slice of unagi is laid on each potato fritter and topped off with mayo for a quick torch. Orange bits of tobiko and furikake are added as the final touch for added texture and saltiness. Squeeze a little bit of calamansi juice on top for that bit of zing. We all agreed that this is one of the best takes on fish and chips that we’ve ever had. Served cold, this bowl of Prawn Pot Noodles ($8) feels like a Japanese version of our local prawn noodles. 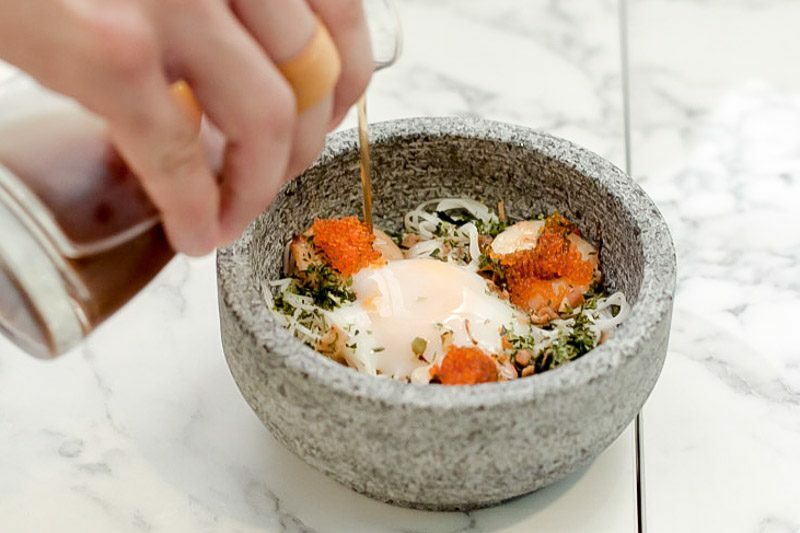 Roasted bacon bits and dried seaweed are added onto a bed of somen noodles, along with three glass prawns that are topped off with tobiko roe. Pour the chilled prawn tsuyu broth over before mixing the creamy soft-boiled egg that sits in the middle of the bowl. Each mouthful is chocked full of complex umami flavours that come from slowly extracting the flavours of the prawns and infusing it into the broth. The somen noodles absorbed the broth really well but we would have preferred a thicker variant of noodle to be used for more bite. 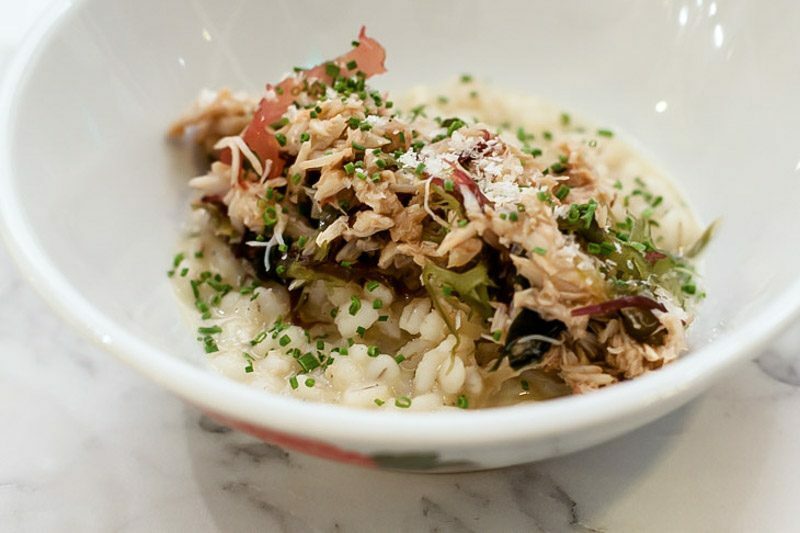 Another staple on the menu is the Crab Porridge ($8) which features pearl barley risotto that is served in a crab-based broth. Topped with shreds of fresh blue-swimmer crab, kaisho seaweed and ponzu sauce, this dish is definitely a celebration of oceanic flavours! While we would have preferred more broth, it was a much appreciated move away from the heavier and cheesier Italian style of risotto. Marble Bistro offers two meat dishes on its menu, one of which is the Leg of Poulet ($15). The chicken thigh is cooked sous vide at 68 degrees Celsius for five hours before being finished in the oven. 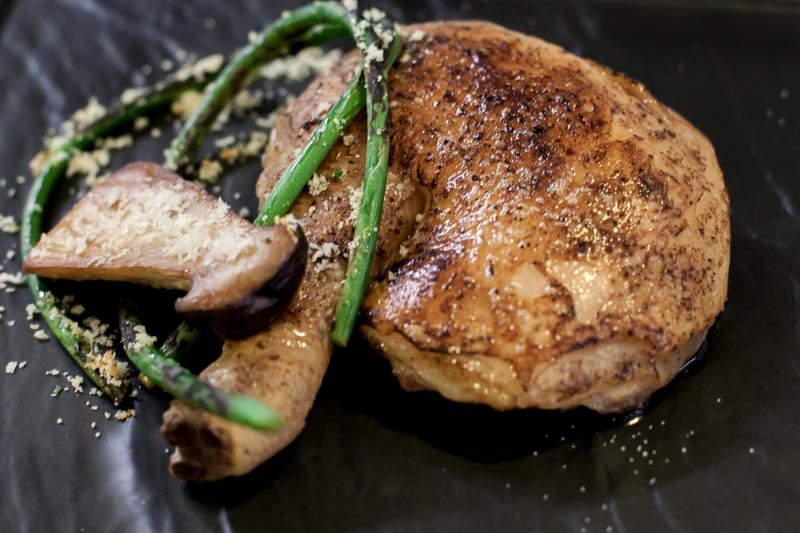 A side of charred vegetables and grilled enoki mushroom is served along with the chicken. Cutting into the chicken thigh revealed juicy pinkish white flesh that might shock some diners. Rest assured that the chicken is cooked to a temperature necessary to kill off any bacteria. Still, if it bothers you, just ask for the chicken thigh to be cooked slightly longer in the oven. The asian rub on the chicken made all the difference and when paired with the cooking style, created a chicken dish to remember. 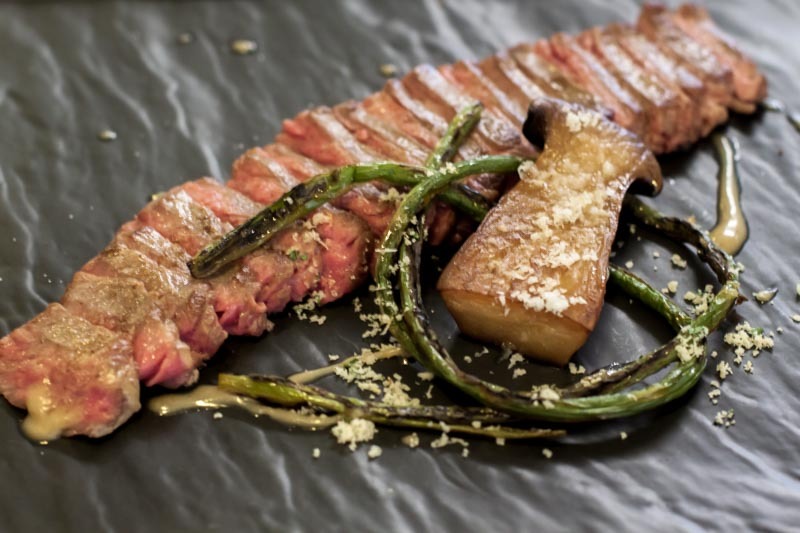 Accompanied with the same sides as the Leg of Poulet, the Beef Steak ($16) features a medium-rare cooked flank steak that is perfectly pink in the centre. A sprinkle of salt and drizzle of light butter sauce over the steak helps to enhance its meaty flavour. Steak lovers are going to appreciate this! Given how early Marble Bistro is into its operations, we can certainly see potential as to how far they can take their unique style of flavour combinations and translate them into dishes that will keep diners coming back for more. We’ll definitely be back to try any new items on the menu, and of course to take pretty photos of the pretty food.